Welcome Field Engineers; This Is Your One-Stop Shop! What’s a Computer Service Technician? 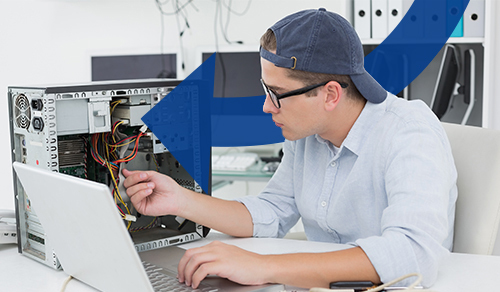 They install, maintain, repair and analyze all types of computer equipment. Their skills and experience may allow them to specialize in various areas such as networks, servers, user support and repair. On a day to day basis they will be testing and troubleshooting computer networks, installing and preserving software, performing maintenance and repairs on computer equipment, training non-IT professionals, providing emergency services in the case of a disaster and so much more to keep a company’s IT system working effectively. Why Do You Need FE? You could take advantage of our tools to find a freelance computer service technician for your business right away. Hire from a pool of over 40,000 highly skilled engineers in and around more than 180 countries. We pride ourselves on having a global presence, so that you can run a more cost effective business, reducing operating expenses and allowing you to maintain a presence overseas. You will also have the freedom to take on short term projects without having to hire new staff, as all of our fantastic engineers are hired on a freelance basis. Finding the right person for the job couldn’t be easier with our streamlined, efficient process on our hiring portal. By posting the details of the job and the skills you require we will connect you with the perfect applicants from anywhere in the world. So sign up now and post your job orders. With FE you can engage on-demand engineers to carry out repairs right away so that you can maintain, scale and solve any problems with minimal delay.